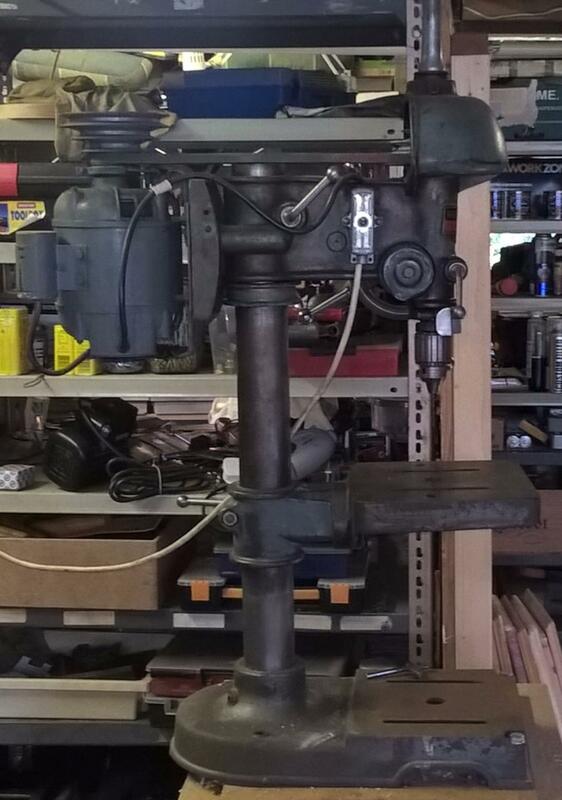 When I picked this bench drill up it had some aluminium flashing folded over to make a belt guard. The spindle cap was a coke can. I think it looks better without it. Apart from some flaking paint and some surface rust the machine was in good condition. It was missing the bearing from the top of the turret (upper pulley wheel bearing) so it rumbled like a Bedford van at 35mph the first time I fired it up. Fortunately I had one available from a third machine I had bought for spares. This third machine proved to be an invaluable donor and I swapped the tables as it had a locking bolt underneath which makes it a lot easier to use. It wasn't a tilting table like the model featured below but it didn't matter as I don't think I needed one until after I had sold it on. I made the wooden table after reading John Whites book "The Care and Repair of Shop Machines". It is more or less and exact copy and they say imitation is the greatest form of flattery. 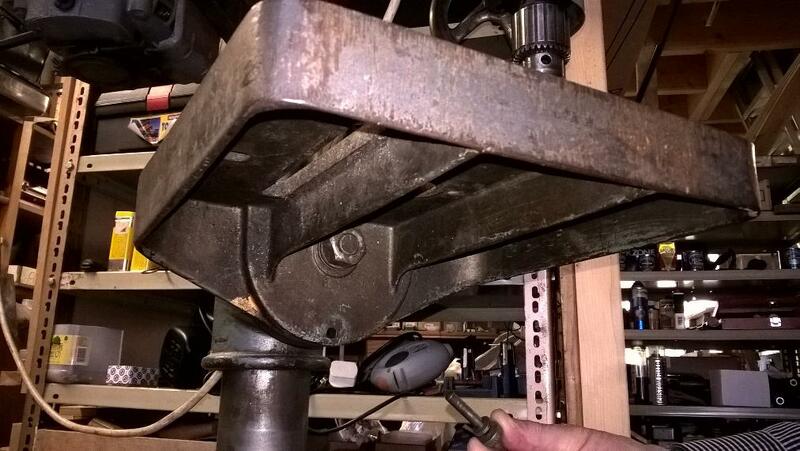 The NVR switch is off an old Nutool table saw as the drill came without one. Rather than fixing it to the drill I placed it on the wall at a convenient height as that is a permanent position for the drill now. 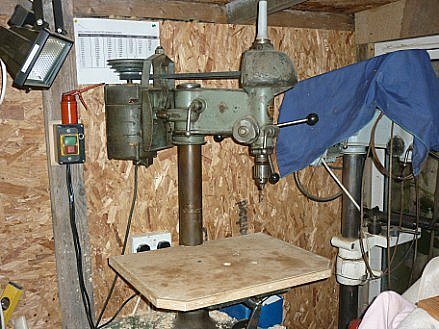 In the background you can see the WT floor drill and it's imaginative drill table combination. As the WT700 restoration project nears completion it raises the question of whether this 900 will be next. However it is running fine and quietly, has much of its original paint though in poor condition, so I am tempted to not to touch it for now and but leave it in its ex-factory condition. 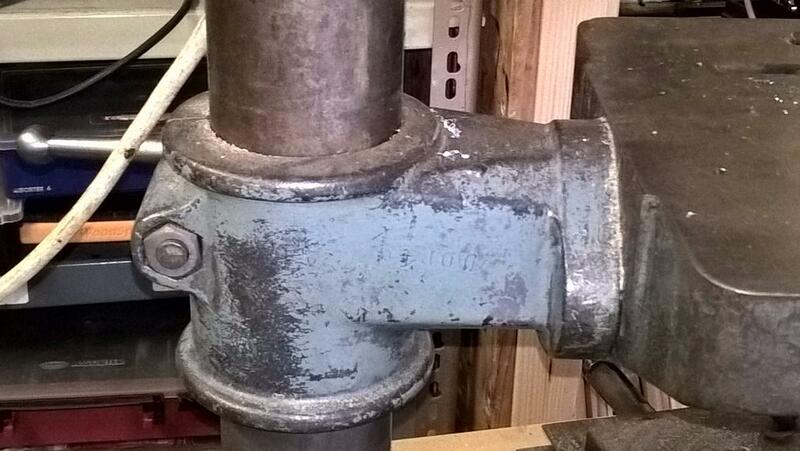 After all it's not looking too bad for a 70 year old piece of industrial machinery. Let's face it a lot of younger machinery and let's not skirt the subject, cheaper made machinery has already been buried underground. Perhaps if I come in to possession of that greeney gray paint colour I may be more tempted. 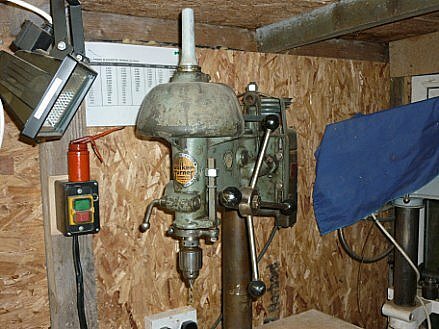 But for now it's a working bench drill. UPDATE: these have both been sold on. From the side without the home fabricated belt guard on. And with belt guard on for the H+S freaks that occasionally complain to me. And obviously the other side with guard on. You can leave your comments in the Guestbook. Just click on the highlighted text. 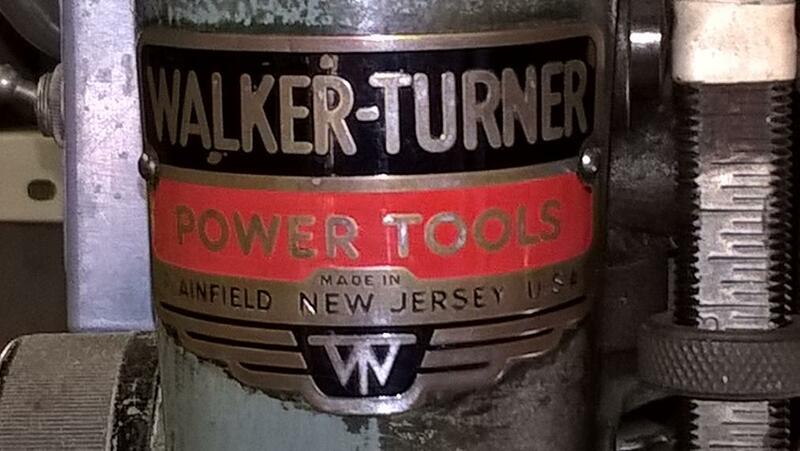 Next up is a fine example of an earlier WT900 owned by a workshop friend of mine, Mike. He is an active engineer with an affinity for Coronet machines amongst many others. A catalogue of his machinery would take up a page of its own...hmmm there's an idea. This machine came via that well known auction site that begins 'e'. It came with the traditional flaky paint and surface rust but once oiled and greased and rewired, it started first time. The badge on the front means that it can be identified as early 1930s not late 1930s as mine indeed is. 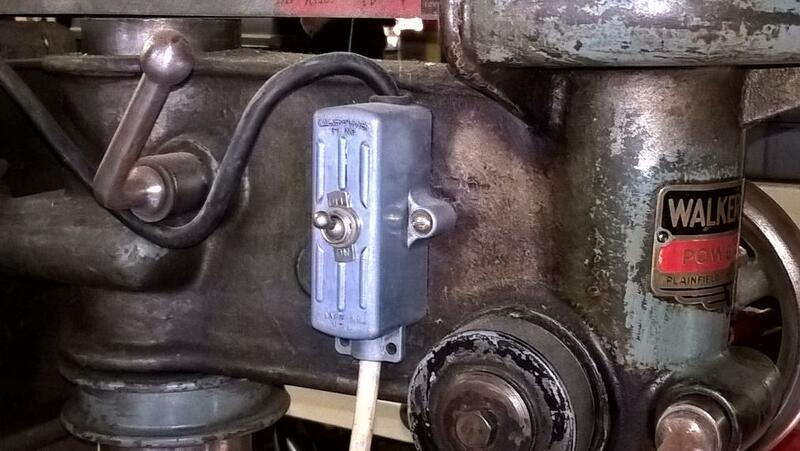 Below we can see the Art Deco style switch in closer detail. This kind of original switch are often refitted by American enthusiasts and it's rare to see them on machines over here. Probably wouldn't pass a H+S muster. It's a real treat to see one on Mikes machine. The tilting table. Underneath you can see the securing nut and the locking pin which Mike is holding. Mike owns his own image rights but I got an exemption for the use of a whole thumb and fraction of forefinger in return for accreditation. Thank you Mike. The complete casting for the tilting table assembly. The electric motor spec plate. 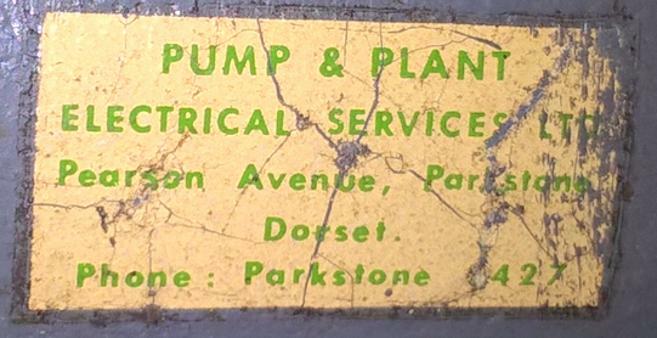 A sticker with a previous owners details. Hopefully they won't come knocking on Mikes door demanding that he return as the bloke he bought it off had no right to sell it as it was still theirs. Unlikely but it might happen. Thanks for letting me get some pictures for the site. Nice to see an earlier model for a change. More models needed. And in answer to my request this fine example appeared from Julian Harrison of WT table saw fame. 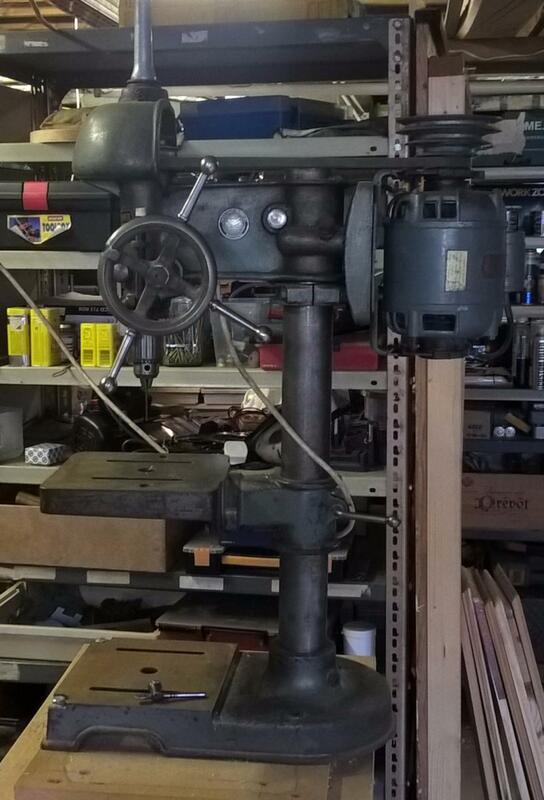 This machine has been completely restored and repainted by Julian and the pictures will be up here as soon as I can load them. I'm having the usual problems with the site builder. Actually I'm the problem to be honest. Finally I can reveal the gallery below. The gallery below shows the reassembled machine. What a cracking job Julian has done and I look forward to his next effort, another WT table saw.